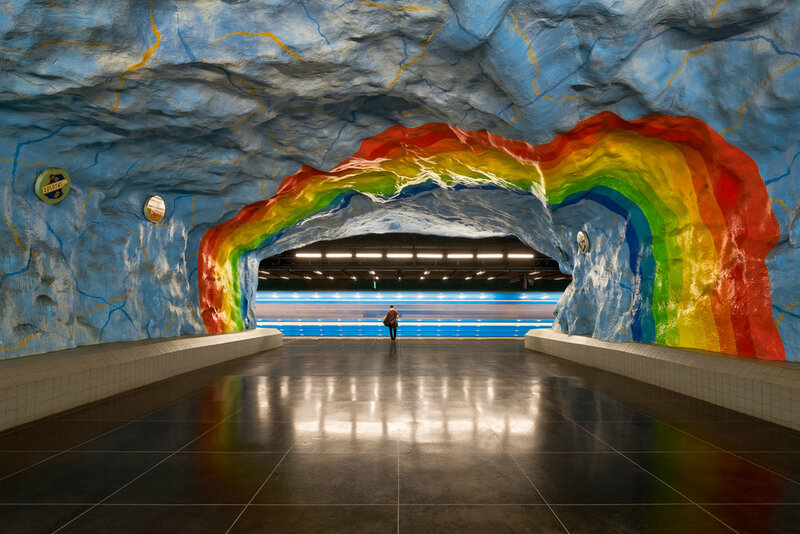 In my opinion, Stockholm's Tunnelbana stations are some of the most beautiful in the world. The entire network is promoted as the world's longest art gallery. The stations are all unique and most feature paintings, sculptures or murals. I recently visited Stockholm for a long weekend and spent most of my time underground…visiting and photographing my favorite stations. This is Stadion near the Olympic Stadium. It was one of the city’s first cave-like stations that features the exposed bedrock. The artists, Åke Pallarp and Enno Hallek wanted to remind the people that there is a sky not too far above, so the entire ceiling is painted bright blue. In addition, the rainbow represents the colors of the Olympic rings and serves as a tribute to the Olympic games hosted by Sweden in 1912. The person on the platform happened to stand perfectly still as I took this 3 second exposure of the train pulling in to the station. I suspect there are few people whose main interest when visiting Stockholm is to wander through its subway stations. I am one of those people. The Tunnelbana consists of 100 stations and several of them feel more like art exhibitions than mass transit locations. I was only able to visit a handful during my short stay in Stockholm, but this one was on the top of my list and it is absolutely striking…it is the Solna Central station. Some of the older stations are dug into the bedrock and have bare, exposed rock walls instead of finished interiors. In this station, the exposed rock has been painted to create a panoramic image. Scenes with forests, waterfalls, people and animals adorn the walls as you walk from one end to the other. However, at this set of escalators, all you see is red and black. Having just descended the long, deep escalator, finding this was a little surreal…maybe even a little unsettling. :) But I also found it fantastic and had to capture some images. Strangely, there were very few people in the station with me, so it was rather easy to get an image without people going up or down the escalators. I have to think that if Hell wanted a grand entrance (or exit), this would do quite nicely.